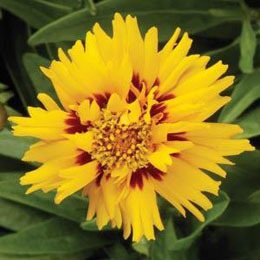 Rising Sun Coreopsis is an award winning, easy to grow, tall growing yellow flowering perennial. The Rising Sun tickseed grows in the 3 foot tall range with an almost as wide spread before it needs to be divided. The double bright yellow petals are showy with flecks of red in the center. Space your Rising Sun plants every 8 to 10 inches for best control and fill in. Coreopsis is one of our easiest to grow garden plants. Commonly called Tickseed, coreopsis is a summer to fall blooming perennial plant that will attract butterflies to your garden all summer long. Plant Coreopsis Rising Sun in your sun garden or containers for easy care and blooming from summer to frost. Photo courtesy of Pan American Seed the leading breeder and producer of open pollinated flower seeds.